Telling Your Company or Product Story. Digitally. When Shanthan posted in the Facebook Amazon Echo group that he’d written a game for the Echo because of his son’s love for the device, I was interested to learn more. The result is this interview. Enjoy! How did you become an Echo developer? Is there a Web site where you had to sign up and gain API access? As a tech enthusiast, I am constantly intrigued by emerging technologies which I love to learn and apply. I preordered Amazon Echo upon its announcement in 2014 and it was an instant hit in my household once it arrived in 2015. We use it primarily for maintaining our shopping list, listening to music and checking the weather. Quite handy given it is hands free and we do have our hands full with a preschooler and infant at home. When Amazon announced the Alexa Skill Kit, enabling and empowering developers to code and contribute their own skills, an idea dawned on me. What was your original concept for your Skill and how did it evolve as you coded it? My preschooler likes to play with voice enabled devices and really enjoys the concept of a talking device that responds to him when desired. Before Alexa, Siri was his go to talking device. He used to play with Siri on my iPhone asking questions like “I want Pizza” or “I want Ice Cream” and when Siri responded with the nearest Pizza store, he thought was very cool. Upon the arrival of Alexa, he was doing the same with it, but this constant verbal engagement with the device was annoying to us as parents after a point. One day, he was on FaceTime with his uncle, who was asking him basic math questions and when his uncle appreciated him for every right answer, he was ecstatic. It immediately struck me, to create an Alexa skill which can do the same so we can keep him engaged and learning at the same time. The 1-2-3 Math skill that I created has the ability to randomly ask questions based on templates derived from Kindergarten and first grade books. Upon every correct user response, the skill responds with appreciation. Upon an incorrect response or when the user says “I do not know”, the skill responds with the correct answer. Once enabled, the 1-2-3 Math skill can be invoked by saying “Alexa, Play one two three” or “Alexa, Open one two three”. My son uses the skill for at the least 10 minutes daily and he loves it. As parents, we are happy, because his time with Alexa, is now well spent. It is a win-win for both of us. 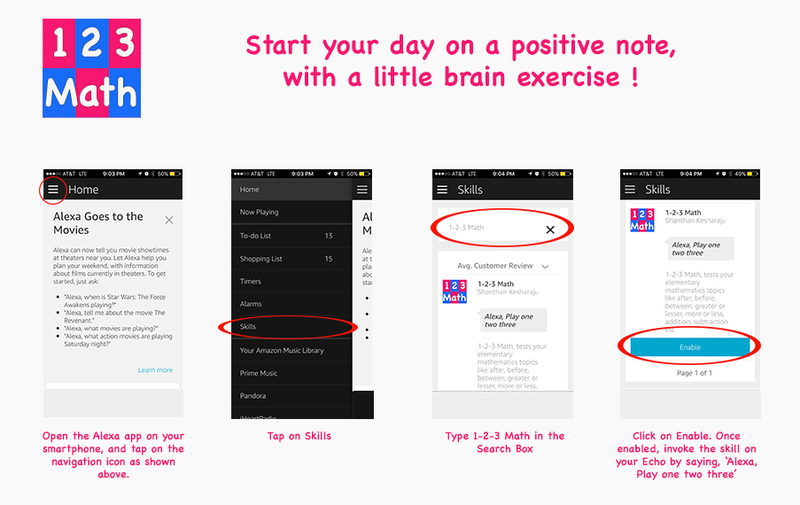 I use the skill myself, every morning, to exercise my brain, and start the day on a positive note. You programmed it in Java. Are you already a Java programmer? I chose The Lean Startup Build-Measure-Learn model as the core foundation to launch this skill. The first minimum viable product (MVP) which is now live asks the user random questions based on certain templates. There were 1000+ unique users and 10,000+ utterances in the first three days since its go live. This is a huge positive reinforcement for me to plough forward. The future planned MVP is a game version, which can be played with multiple players. Making the skill adaptive so the user is constantly challenged based on his current skill level is on my roadmap as well. My intent is to closely monitor the built in metrics to measure, learn and improve the product. You will need Amazon Developer and Amazon Web Services accounts to be able to create and publish your skill. I have written “1-2-3 Math” using Alexa Java SDK and Amazon Lambda, but you can also use Node.js or Python. The details on how to get started can be found on the Amazon developer site. Tell us a bit about your background too, Shanthan. Are you a professional programmer? My favorite weekend routine is to play Lego Building with my son, read about Entrepreneurship and Innovation and tinker with IOT devices like Raspberry PI. I also love taking statistics courses on Coursera and Udemy as Data Mining has been a passion of mine since my graduate days in Oklahoma State. Last Fall, I have taught a course on Entrepreneurship to middle schoolers, through the Citizens School program. Great stuff, thanks for the interview, Shanthan! Sporadic Weird News… from me! Facebook Posts Affect Business Reputation, Scott! Can You Trust Voice and Facial Recognition Systems? Cellphone Charger With Those Chicken Wings?